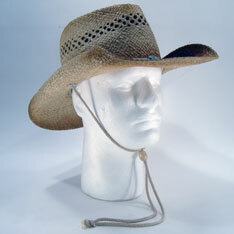 Premium quality pre-formed hat of tanned and cured straw for the home-on-the-range look. Crown size 5 1/2 inches. $6.50 each for 24 or more. $5.65 each for 48 or more.